A previous post looked at the USDA baseline for corn prices and pointed out that the baseline did not quickly capture the dramatic shifts in supply and demand that were occurring in the corn market. We shouldn’t be too critical of the USDA (and keep in mind the baseline is not really a forecast but a projection of current conditions into the future). The USDA was not the only group that failed to forecast the dramatic rise in commodity prices. The figure below shows the USDA forecasts covered in our recent post and the average February closing price of December futures markets in the corresponding forecast years. The futures markets do not trade out as far as USDA forecasts, typically 3 years but in some years futures prices were available for four years into the future. You should also keep in mind that contracts out several years are very thinly traded. Figure 1. USDA Baseline Corn Projections, Actual Market Year Corn Prices, and December Futures Prices, Various Years, 2003-2013. 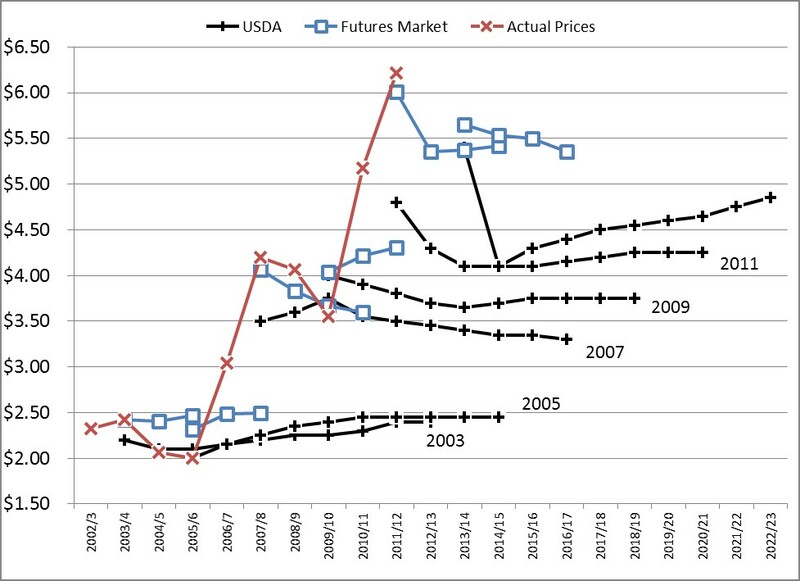 One can see that, like the USDA, in 2005 the futures market was not anticipating the large upward shift in corn prices. Specifically, in February of 2005 the December 2007 corn futures contract traded at an average of $2.49 per bushel and by the time that 2007/08 crop arrived the actual farmer price received was $4.20 per bushel. While these aren’t forecasts of exactly the same thing — the USDA is forecasting the market year average price and the futures market is pricing grain for delivery in December of a particular year, I think that it one can still make the point that the futures market didn’t anticipate the large increases much earlier than the USDA. By 2009 the futures market for the next two years was predicting prices to rise and USDA was still projecting the standard downward price movement. The bottom line suggests that the futures market will give us clues more quickly than USDA but probably not a lot earlier. Where are the December futures prices today relative to USDA’s baseline? A quick check of prices as of July 17, 2014 shows December futures for future years trading in a range of $4.26 (2015) to $4.50 (2017). All of these prices are higher than the USDA baseline which ranges from $3.30 (2015/16) to $3.45 (2017/18). Who will be right? Or perhaps we should say will either be right? Time will have to tell but the stakes are high. A difference of $1.05 per bushel for the 2017 marketing year could amount to nearly $200 per acre of revenue on high quality farmland.